another request – and the place is very fitting: the german author kurt tucholsky was a great admirer of heinrich heine. and like heinrich heine kurt tucholsky was poetic, political, and witty, oscillating in his writings from the pure entertaining to the polemic to the lyrical. the century is now the 20th, but it was still – or again, dangerous to be a true moralist, to point out the cynicism of power, to worry about and criticize certain developements in society. consequently tucholsky’s books have been burned (together with books by heinrich heine and many other authors) by the nazis – but by then he already lived in sweden, where he also died in 1935. for more on kurt tucholsky: wikipedia is a good way to get started. and this request also fits quite well because it has been published in a series not of poesie und musik, but literatur und musik. on this record there are only two spoken passages, the rest are songs, most of them composed by hanns eisler. the interpreter is the german actor wolfgang reichmann, who was born just three years before tucholsky’s death. wolfgang reichmann himself died in 1991. he was primarly a “tv-actor”, but played also in many movies – the most know directors he worked under might be orson welles (the proces), and werner herzog. and then it is a very good occassion to point you into the direction of the very interesting zero g sound-blog. not only did he post already interpretations of songs with lyrics by kurt tucholsky, together with quite a bit of information, but he just posted also some more works by the composer hanns eisler. AND he also just posted a record by brühwarm – a collaboration of the very gay theather group brühwarm with ton steine scherben / rio reiser. obviously highly recommended! starting with kurt tucholsky i will post some more on artists of the 20th century. i have been listening and then also researching once more quite a bit of different biographies of artists that lived through these difficult times. and well, it is in many ways very interesting. somehow it also takes again the thread up of some music i posted earlier like sein and element of crime. music that refers to a heritage the nazis tried to eliminate… and it some ways it also fits with my more focused interest in gay history that has been due to a couple of books and texts sparked again. more about that later. 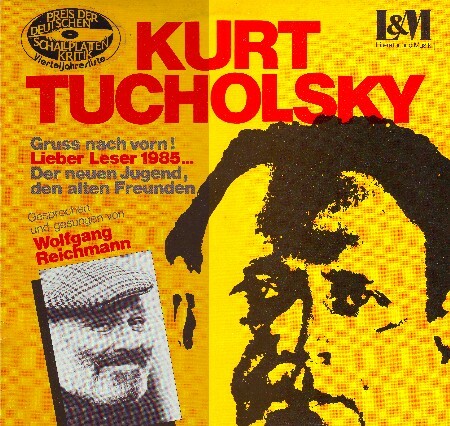 so – for now i propose you some songs with kurt tucholsky and wolfgang reichmann – ripped again from one of my many vinyls, including the cover scans. get it here! and enjoy!